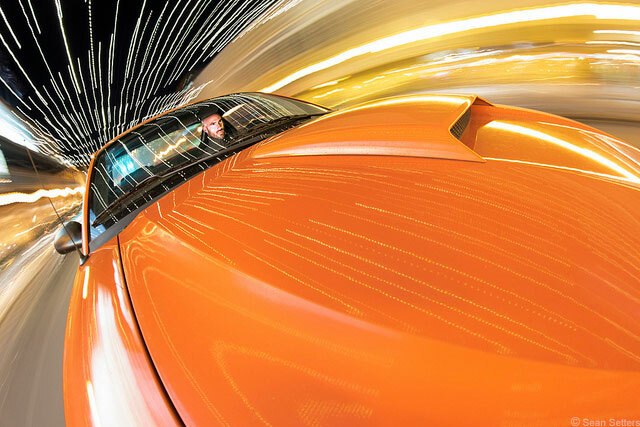 Have you ever wanted to mount your DSLR to an automobile for awesome, dynamic-looking action shots? 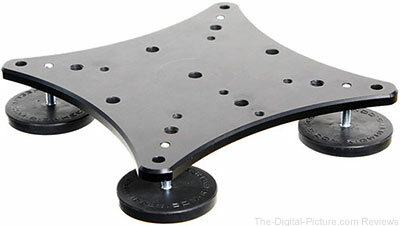 If so, the RigWheels RigMount X4 Magnetic Camera Platform may be just what you've been looking for. The RigWheels RigMount X4 Magnetic Camera Platform comes with (4) Long Magnetic Mounts which are constructed of a 2.58" x 0.34" [D x W] (6.6 x 0.86cm) rubber coated magnetic base and a 1.2" (3.8cm) 1/4"-20 screw. Designed with rare Earth magnets, each magnetic mount is capable of holding up to 50 lbs, providing an amazing 200 lbs of holding strength with all four of the supplied magnets firmly affixed to a magnetic surface. While the included long magnets work well for most automobiles, there are a few things to keep in mind. The first is that not all automotive hoods are made of metal; many are made of molded ABS plastic. If mounting to a non-magnetic surface is required, RigWheels' RigMount Suction Cups [sold separately] can be used in place of the magnetic mounts. Even if a vehicle has a non-magnetic hood, the fender panels (the area around the front wheels that wraps around to the hood area) are usually made of ferromagnetic alloy and may provide enough surface area for securing the RigMount X4. Personally, I prefer using magnets over suction cups because a magnet's holding strength remains constant while a suction cup's ability to remain firmly attached may degrade over time with changes in temperature, the strain of consistent force or the effects of increased wear. The second issue is that automobiles generally do not have large, flat surfaces for convenient magnetic mounting in the places optimal for framing purposes. RigWheels compensates for uneven surfaces by incorporating numerous mounting holes in the plate (allowing for flexibility in positioning the magnets) and providing long bolts on the magnets for vertical adjustments. Even so, a firm hold can be elusive if one's magnetic surface area is small and/or narrow. Such was the case when I tried affixing the RigWheels RigMount X4 to my own car. Even having owned the car for 11 years, I never noticed that its hood wasn't made of metal (cars having metal hoods was something I took for granted). And unfortunately, the fender area I wanted to use as the mounting point proved too small for me to comfortably position the four included Long Magnetic Mounts. Thankfully, I had also purchased the RigMount with Small Ball Head (which is simply an RMS1 with a ball head attached) along with the X4 for mounting small LED lights. The accessory proved to be the perfect tool for providing an articulated magnetic mount in place of one of the standard Long Magnetic Mounts in the X4. This allowed me to obtain a firm hold using the complete holding power of four magnets while positioning the mount on the very edge of the automobile, a spot that would otherwise not have allowed for securing the platform because of the angled fender. With all four magnets having solid [or nearly solid] contact with a ferromagnetic surface, the holding strength of the RigMount X4 platform is very impressive. So impressive, in fact, that I had no reservations mounting a gripped EOS 5D Mark III / 7D Mark II and traveling at a sustained speed of 35 mph (56 kph). There were even a couple of instances where my speed climbed to 40 mph (64 kph) as I neglected to maintain my pre-determined target speed. Thankfully, the rig never budged and remained firmly affixed to my car. To capture the image above, I mounted a Canon EOS 7D Mark II with a Rokinon 8mm f/3.5 Fisheye Lens to a ball head bolted onto the RigMount X4 which was attached to the car using three RML1 [Long] Magnetic Mounts and one RigMount with Small Ball Head (for optimal holding strength on the uneven front fender area of the automobile). I used a Canon W-E1 Wireless Adapter and DSLR Controller app set to intervalometer mode to capture a wide range of imagery throughout my 15 minute drive. The lighting was provided by a single Canon 580EX Speedlite Flash with a Roge FlashBender 2 (Small) attached and positioned just in front of the dashboard radio. Note: While the EOS 7D Mark II has an built-in intervalometer feature, the W-E1 allowed me to easily adjust various exposure settings and preview images using my smartphone while parked and testing out various lighting setups. The RigMount X4 Magnetic Camera Platform used for this review was purchased online/retail. 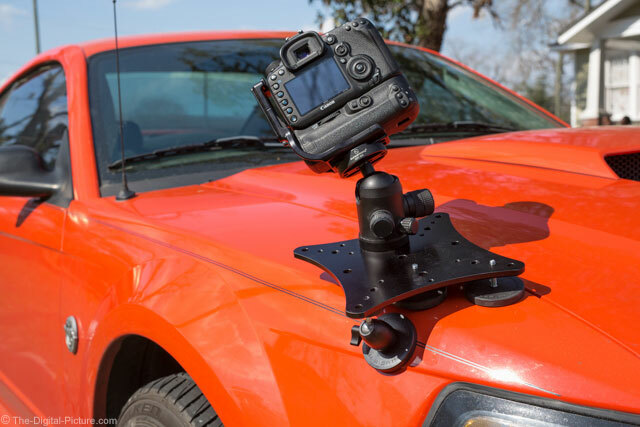 As you can see, the RigWheels RigMount X4 Magnetic Camera Platform allows you to safely (within reason) mount your camera to an automobile (or other magnetic and non-magnetic surfaces, depending on the accessories used) that would prove problematic or impossible with other mounting solutions. Considering the overall security provided by the mount and the value of the gear likely to be used with it, the RigMount X4, though not inexpensive, should prove well worth its cost for those who want peace of mind while creating captivating imagery from unique vantage points.